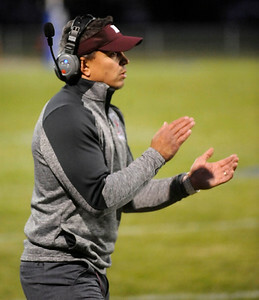 Gregory Shaver for Shaw Media Marengo Head Coach Paul Forsythe cheers for his team during the first quarter of a football game against Woodstock Friday evening, Sept. 8, 2017, at Woodstock High School's Larry Dale Field. 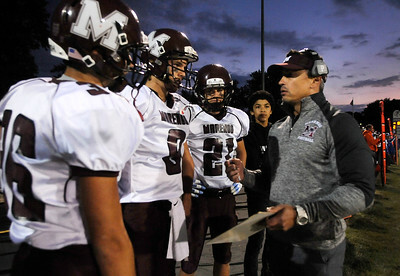 Gregory Shaver for Shaw Media Marengo Head Coach Paul Forsythe, right, talks with quarterback Travis Knaak, #8, Oliver Muradian, #36, and Michael Anderson, #21, during the first quarter of a football game against Woodstock Friday evening, Sept. 8, 2017, at Woodstock High School's Larry Dale Field. Gregory Shaver for Shaw Media Marengo Head Coach Paul Forsythe watches his team during the first quarter of a football game against Woodstock Friday evening, Sept. 8, 2017, at Woodstock High School's Larry Dale Field. 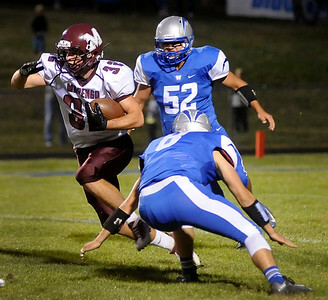 Marengo's Finnigan Schirmer, #32, runs between Woodstock's Michael Gardner, #8, and Jacob Waryck, #52, during the first quarter of a football game Friday evening, Sept. 8, 2017, at Woodstock High School's Larry Dale Field. Woodstock's Dylan Grisolla, #44, is tackled by Marengo's Aaron Shepard, #7, during the first quarter of a football game Friday evening, Sept. 8, 2017, at Woodstock High School's Larry Dale Field. 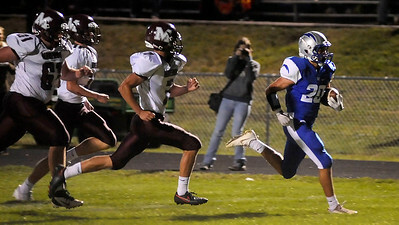 Woodstock's David Shinherr, #20, runs away from the Marengo defense for a touchdown during the first quarter of a football game Friday evening, Sept. 8, 2017, at Woodstock High School's Larry Dale Field. 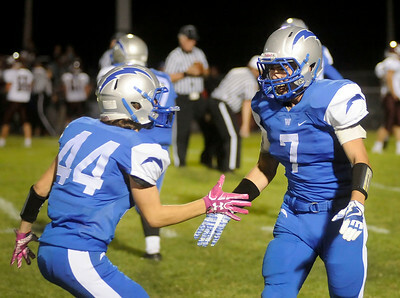 Woodstock's Dylan Grisolla, #44, congratulates his teammate, Calub Casson after Casson recovered a fumble during the second quarter of a football game Friday evening, Sept. 8, 2017, at Woodstock High School's Larry Dale Field. 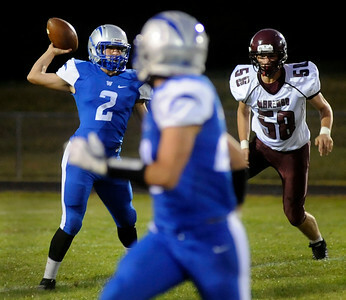 Woodstock's Carl Anderson Jr., #2, throws a pass as Marengo's James Mier, #52, rushes Anderson during the second quarter of a football game Friday evening, Sept. 8, 2017, at Woodstock High School's Larry Dale Field. 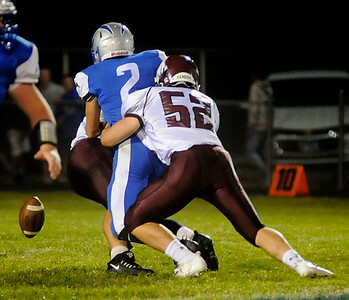 Marengo's James Mier, #52, tackles Woodstock's Carl Anderson Jr., #2, as Anderson fumbles the ball during the second quarter of a football game Friday evening, Sept. 8, 2017, at Woodstock High School's Larry Dale Field. 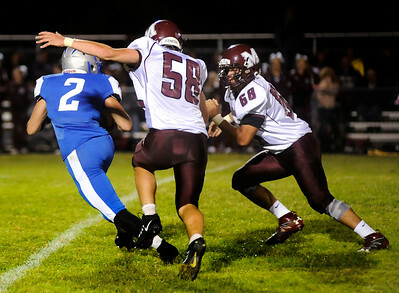 Woodstock's Carl Anderson Jr., #2, is sacked by Marengo's BrocK Bertrand, #58, and Willy Arrioia, #68, rushes during the second quarter of a football game Friday evening, Sept. 8, 2017, at Woodstock High School's Larry Dale Field. Woodstock's Carl Anderson Jr., #2, throws a pass as Marengo's BrocK Bertrand, #58, rushes Anderson during the first quarter of a football game Friday evening, Sept. 8, 2017, at Woodstock High School's Larry Dale Field. 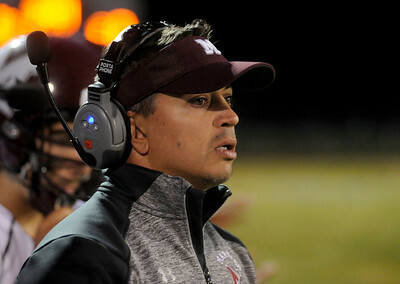 Marengo Head Coach Paul Forsythe watches his team during the first quarter of a football game against Woodstock Friday evening, Sept. 8, 2017, at Woodstock High School's Larry Dale Field.